When I think back on my favorite discontinued foods of the 1970s and 1980s, the two that come first to mind are always Pepsi Light and Marathon candy bars. Pepsi Light, of course, was Pepsi with lemon--started out with half the calories of regular Pepsi, then they came out with a one-cal version. Marathon bars were braided caramel dipped in milk chcolate and wrapped in a bright red wrapper with a ruler on the back. Their gimmick, besides being sheer awesome, was their length. 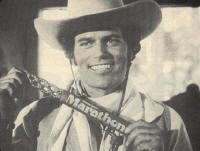 The commercials featured John Wayne's son, Patrick, as Marathon John, who battled with Quick Carl, who thought he could do everything fast, but couldn't manage to choke down a Marathon bar quickly. As kids, we were looking for anything to make our limited pocket money stretch a little further, so Marathon bars were just what the doctor ordered (ditto Bub's Daddy, the giant sticks of gum). And if you went to Catholic school in Minnesota like me, your school had a fundraiser called the Marathon for Non-Public Schools, where you walked a certain distance and got pledges and raised cash for your school. At my school at least, Marathon bars were the fitting prize for getting to certain pledge levels, and since I was never one of those gung-ho pledge drive kids, I never won any. I'd sure buy a Marathon bar if it was around today, though, and wash it down with a big can of Pepsi Light. I was told that, in the UK, Marathon bars were re-branded as Snickers. I never had one, but were they that similar? Marathon bars sound like Cadbury's Curly Wurly which is sold in Great Britain. I've also found it at World Market. They're so delicious in they're simplicity. Marathon Bars were a favorite of ours when we were kids, and I totally remember that commercial. My best friend and I would trek to the candy store after school to buy one and it would last all afternoon. It was always either a Marathon or a Jolly Rancher Watermelon Stick. Marathons and chocolate Carnation Breakfast Squares are my most-missed of all the vanished favs from back then. Wish someone whould start making them again! Jackie: I know that Snickers now uses the Marathon name for an "energy" bar, but it's nothing like the choco-caramel twists I pine for. They're scamming us by reusing the name! I guess you're supposed to think of running marathons and thus energy, but all I think of is how much I miss the original! This was my favorite as a kid. I loved that it had a ruler on the back. Then, it got smaller, lost the ruler, and eventually disappeared. I'm still mad.